Acrylic nails are used to artificially enhance the appearance of natural fingernails. The term "acrylic nail" covers a range of product types, including press-on nails, nail tips, and sculpted nails. The first press-on acrylic nails were developed in the early 1970s; these were nail-shaped pieces of plastic that were glued on over natural nails. Early press-ons did not look natural and did nothing to strengthen real nails. Nonetheless, versions of this product could still be found on the market nearly 30 years later. Modern technology has advanced to allow development of more natural-looking nail enhancements which bond to the real nail. Early attempts at making these enhancements used the same plastic resin employed by the dental industry to make false teeth. This type of resin, known as an acrylic, is created by mixing a liquid and powder together to form a thick paste. The salon technician smooths the paste into place over the natural nail and allows it to dry. The resin then hardens to form a durable finish that is filed into the desired shape. Dental acrylic is no longer used because it caused allergic reactions in many people, but improvements in resin chemistry have essentially eliminated that problem. Today, acrylic chemistry is used to make a variety of nail enhancements, including nail tips, wraps, and sculpted nails. This article will focus on how sculpted acrylic nails are made. Artificial nail enhancements are made of acrylic plastic. Acrylic is the generic name given to the type of plastic made from a chemical called methacrylate. There are many types of acrylic resins based on different types of methacrylate molecules, but their chemistry is similar. 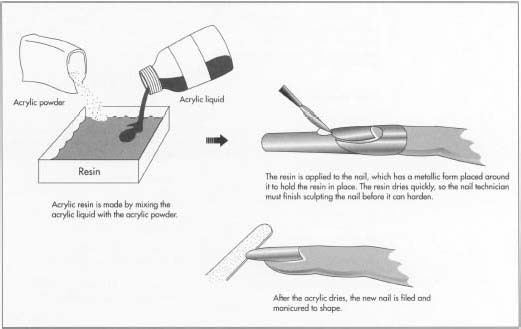 The acrylic used in sculpted nails is formed by the reaction of a monomer liquid with a polymer powder. The monomers ("mono" meaning "one") contained in the liquid are microscopic chemical units which react together when mixed with chemicals in the powder. The monomers combine with one another in a head to tail fashion to form long fibers. These long chains of connected monomers are called polymers ("poly" meaning "many"). A powdered polymer is then blended with the liquid to adjust the consistency of the plastic. The powdered polymer typically used in acrylics is polyethylmethylmethacrylate (PMMA). PMMA yields a very hard inflexible plastic, but it may be blended with softer polymers to improve its flexibility. When the polymer powder and monomer liquid are mixed, the polymer fibers react in a process known as crosslinking, forming a rigid netlike structure. The polymer strands will eventually dry to form a hard resin that can be made to resemble a fingernail. Other ingredients are added to the monomer liquid and the polymer powder to control the properties of the resin. Crosslinking agents are used to hook the polymer chains together to make the plastic more rigid. The most common is ethylene glycol dimethacrylate. The polymer powder also carries an initiator, which starts the reaction that links the monomers together. A common initiator is benzoyl peroxide (BP), the same ingredient used in acne creams. When the liquid and powder are mixed together and applied to the client's fingers, the BP molecule is capable of exciting or energizing a monomer. Once energized, the monomers join together to form a polymer. Catalysts are also added to the formula to control the speed by which the initiator activates the reactions. A relatively small amount of catalyst is required to do the job, typically about only 1% of the monomer. Chemical inhibitors are added to the liquid monomer blend to prevent the monomers from reacting together prematurely, which turns the liquid into an unusable gel. Inhibitors help prolong the shelf life of the monomer solution. Plasticizers are used to improve resin performance. These liquids help lubricate the polymer chains so they are better able to resist breaking caused by stress. A variety of ingredients are added to complete the resin. Dyes and pigments may be included to alter the resin's appearance. For example, titanium dioxide, a pigment commonly used in house paint, is used to whiten the nail and create a more natural appearance. It is also used to create special color effects like the white nail tips used in French manicures. Other colorants are added to give the polymer a pinkish or bluish color cast; these shades give a pleasing color to the nail bed. Flow agents are added to help control how polish spreads on the surface of the resin. Finally, color stabilizers are used to prevent yellowing. These materials absorb ultraviolet light that can cause discoloration of the resins. Every company that produces acrylic nail kits uses the same basic chemistry. However, each has designed its own formula with its distinct advantages and disadvantages. The real design work in creating acrylic nails is done by the nail technician. Each set of sculpted nails has its own idiosyncrasies which must be taken into account when designing the acrylic nails. In this sense, the technician designs the shape of the nail based on the requirements of the client. Sculpted acrylic nails are not manufactured on an assembly line by a machine. Instead, as the name implies, they are "sculpted" by a nail technician. Each handcrafted nail is formed one at a time using a process which consists of the following steps: cleansing, priming, mixing, sculpting, and finishing. 1 Before the new nail can be sculpted, the natural nail must be properly prepared. A nail bed cleanser is used to thoroughly clean the surface of the nail. These cleansers are typically solvents such as isopropyl alcohol, which dissolve oils and grease from the surface of the nail. They will also remove bacteria from the area to help reduce the chance of infection. Care must be used when applying these solvents because they may dry out the skin surrounding the cuticle. This occurs because the solvents also remove the skin's own natural moisturizing oils. 2 After the nail bed has been cleansed, a primer is applied to the nail bed to make sure the acrylic will adhere properly. Primers are available in two types, non-etching and etching. The non-etching type works like double-sided tape; one side of the primer is very good at sticking to the natural nail, and the other end is equally attracted to the acrylic polymers used in the artificial nail. The etching type of primers are acids, such as methacrylic acid, which actually dissolve a thin layer of the nail itself. 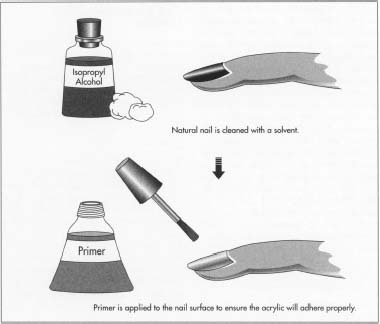 This etching process allows the acrylic to adhere to the nail better. The etching primers are more commonly used than non-etching. There is some debate regarding the proper use of etching primers; some chemists argue that the primer should dry thoroughly before applying the acrylic. Others believe that the acrylic should be applied while the primer is still wet to pull the acrylic deeper into the nail and anchor it more firmly. nail technician must work quickly with the resin once the liquid and powder are mixed. If not, the resin will harden before it can shaped into a nail and will not be useable. 4 Before the resin is applied, a nail-shaped form is placed over each fingertip in order to hold the resin in place and ensure it takes the correct size and shape. These forms may be made of metalized foil or plastic. One common type consists of a thin metallic foil with an adhesive backing. The form is peeled off a roll (like a label) and carefully affixed to the fingers. The technician then applies the resin to the client's fingertips. The resin is sculpted to look as natural as possible before the resin hardens. The form is then removed. 5 After the acrylic dries, the new nail is filed and manicured to shape. Finally, coatings and polishes are used to complete the manicure. As the natural nail grows, further application of the liquid plastic is needed for the acrylic nail to maintain a regular contour. In some cases, an acetate tip is also applied to the end of the nail to provide a stronger base for the layers of acrylic resin. long periods of time. Likewise, technicians need to be protected against inhaling the dust that is created when they file acrylic nails. A simple dust mask is usually sufficient in this regard. In the United States, the Food and Drug Administration deals with the safety of cosmetic chemicals. In the early 1970s, the FDA warned against the use of methyl methacrylate in nail care products because of consumers' allergic reactions to this monomer. The quality of the chemicals used in the nail-sculpting process should also be of key concern to nail technicians. The technicians must learn to recognize basic quality problems in the raw materials they use. For example, a common problem with the liquid monomer solution is caused by the early reaction of the monomers, creating a thickened gel rather than a thin liquid. This gelling essentially renders the monomers worthless. To prevent this problem, inhibitors are added to the monomer blend, ensuring the monomer solution will maintain its quality for one or two years. Technicians must take care that all the raw materials are kept in usable condition; solvents should be tightly capped to prevent evaporation, powders must be kept clean and dry to prevent caking, and emulsion based products must be stored away from temperature extremes to avoid separation. Another factor in assuring quality sculpted nails is to properly control the mixing and sculpting process. The liquid and powder must be added in the proper proportions, and they must be mixed to the correct consistency, or the strength of the nail will suffer. Typically, acrylic nails should contain 35-40% polymer. Too little polymer powder means less reinforcement and lower nail strength. Too much powder makes the nail too hard and brittle. Quality problems can also arise if care is not taken in during nail sculpting. For example, ingredients in some of the adhesive chemicals can cause reactions with the nail and the nail bed. The nails can quickly become cracked, discolored, and misshapen; they may even be permanently disfigured. Another problem is that tiny air pockets form between the real nails and the artificial ones. These spaces tend to become contaminated with fungi or bacteria. Proper mixing and molding techniques help prevent problems of this sort. Future developments in nail enhancement production will be driven by several key factors. First, cosmetic chemists who formulate acrylic nail compounds are likely to continue to develop new formulations with improved properties, such as the ability to be molded more efficiently or to better resist chipping and breaking. Next, consumers and nail technicians may influence development of nail products by creating a demand for a particular style or for new types of nail enhancements. Finally, government regulation may impact the future of nail products. Various state legislatures have enacted laws regulating other aspects of the cosmetics industry. These laws limit a class of chemicals known as volatile organic compounds, which are used in hair sprays, antiperspirants, and other personal care products. If these same laws are expanded to include the nail industry, drastic changes in the way sculpted nails are made will be required. Chase, Deborah. The New Medically Based No-Nonsense Beauty Book. Henry Holt and Company, Inc., 1989. Schoon, Douglas D. Nail Structure and Product Chemistry. Milady Publishing, 1996. Anthony, Elizabeth. "ABC's of Acrylics," NailPro Magazine, October 1994. Hamacker, Amy. "Dental Adhesives for Nails," NailPro Magazine, June 1994. My question is about gel nails - I know this forum is dealing with acrylics, but I can't find what I'm looking for anywhere! My question is: how are the various gels made(what are the chemicals, etc. used to create the product)? What additive is required, in what proportion to make the acrylic nails flexible, chip free?